In January 2017, The Republic of Azerbaijan introduced electronic visas for citizens of 81 countries. The system is called ASAN Visa and the visas are issued for a single-entry visit for up to 30 days. The new e-Visa system makes traveling to Azerbaijan much easier as there is no longer a need to visit your country’s embassy. Today, citizens of 93 countries can apply for an e-Visa through the ASAN Visa system and can get the Azerbaijan e-Visa in just 3 steps. This visa is a pre-entry permission for you to travel to and seek entry into the Republic of Azerbaijan. It is not sticker in your passport. We will email you the document and you must be print it out and present it with your passport at the border control post. A scan of your passport bio page. A contact address in Azerbaijan. The Azerbaijan e-Visa must be used within 90 days from the issue date. The Azerbaijan visa grants a single entry and for a maximum stay of 30 days. You must leave the territory of the Republic of Azerbaijan with the e-Visa that was used to enter the country (except in cases when the period of temporary stay in the country is extended or a temporary residence permit is issued by the State Migration Service of the Republic of Azerbaijan). The validity period of the passport or other travel document should be at least 6 months after the entry date in Azerbaijan. The electronic visa is not adhered to the passport and must be presented with the passport at the border control post. If the electronic visa is not used within the period of validity, it becomes invalid. You do not have to get a visa if you are not going to leave the international transit area. Your e-Visa application should be submitted before your planned date of travel. Even if you are eligible, you cannot obtain a visa upon arrival at the border checkpoint of the Republic of Azerbaijan. You can apply if your purpose of travel is: Tourism, business, medical treatment, humanitarian, sports, culture, education, science, business trip, personal trip or education. In case of rejection of an e-Visa application, foreigners and stateless persons may re-apply for a visa at a relevant diplomatic representation of the Republic of Azerbaijan. Travelers with dual or multiple citizenship must choose the country of nationality in accordance with the travel document to be used for their trip. What is the Azerbaijan e-Visa? 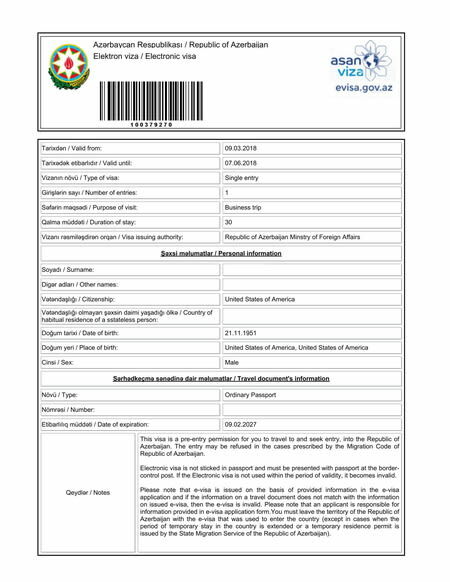 It is an official document which provides authorization to travel to and from Azerbaijan and is electronically linked to your passport. What do I need to apply for an Azerbaijan e-Visa? What is the cost to obtain a Azerbaijan e-Visa? The visa cost for Azerbaijan e-Visa is 25 USD. Additionally, there is a service fee of 20 USD which includes standard processing. For rush processing and super rush processing the service fee is 50 USD and 70 USD, respectively. How long does it take to get my Azerbaijan e-Visa? Standard Processing: 4 business days. Rush Processing: 2 business days. How long is the Azerbaijan e-Visa valid for? The Azerbaijan e-Visa is valid for 90 days after issue. This means you must enter Azerbaijan within 90 days. In addition, it is a single entry visa and allows for a maximum stay of 30 days. How long should be the validity of my passport in order to apply for the Azerbaijan e-Visa? Passports must be valid for at least 6 months from the date the e-Visa is issued. For example, if your e-Visa is issued on 1-Jan, it is valid until 31-Mar (90 days). Your passport needs to be valid until 30-June. Also, it should have at least one blank page. Should I attach my Azerbaijan e-Visa to my passport? No. You must present your Azerbaijan e-Visa to the border authorities along with your passport. You can print it but you must not staple or stick it to your passport. How long can I stay inside Azerbaijan with an e-Visa? You can stay in Azerbaijan for a maximum of 30 days. Please note that if you are planning to stay in Azerbaijan longer than 10 days, you need to register with the State Migration Service of the Republic of Azerbaijan once inside the country. You can do this by asking your hotel to apply on your behalf - they will be able to assist you. Am I allowed to leave and re-enter Azerbaijan with my e-Visa? No. If you leave Azerbaijan you need to obtain a new e-Visa in order to re-enter the country, since each e-Visa only allows you to enter the country once. Can I re-apply if my e-Visa application for Azerbaijan is denied? If your Azerbaijan e-Visa application is rejected, you may re-apply at a relevant diplomatic representation (embassy/consulate) of the Azerbaijani government. Do I need a transit visa if I have a layover Azerbaijan? No. You do not have to get a visa if you are not going to leave the international transit area. I would like to stay longer than 30 days in Azerbaijan. Is this possible? What can I do? You will have to apply with the State Migration Service of the Republic of Azerbaijan – iVisa cannot assist you in extending your stay in Azerbaijan or applying for a visa valid for longer than 30 days. What nationalities are eligible for an Azerbaijan e-Visa? You can use our visa checker at the top of this page to see if your nationality is eligible for an e-Visa. How will I get updated regarding my Azerbaijan e-Visa application? You will receive a confirmation email right after you apply and pay the fee. Check your spam folder if you did not receive anything. You may also contact us via online chat or email us for confirmation. Once your e-Visa is approved, we will notify you via email. Azerbaijan is an incredibly underrated country. Many people think that the economy is weak and that they do not have what to enjoy in Azerbaijan, but they could not be more wrong. Just a little bit of research will entirely change your opinion about this country and the moment you see footage of Baku, which is the country’s capital, you will be under the impression that it looks like a mini Dubai. The modern buildings, the streets, the lights, and everything else in Baku screams glamour, which is why you should definitely go and check it out. As for how to get there, documentation-wise, you should know that there are several methods to obtain what you need. Plus, Azerbaijan has a pretty lenient visa policy, so you should not worry about getting your visa. In fact, we can help with that, but it depends on your nationality. Unfortunately, not everyone has access to an online application system at the moment, but surely the list of eligible nationalities will expand further in the future. Apart from the required documents, there are several other things that we think you should know about Azerbaijan. One of them is arrival. First of all, you can get to Azerbaijan by plane. If you are from Europe, you can fly from pretty much all over, but direct flights can be taken from Frankfurt, London, Paris, Berlin, and Barcelona. You can either use Lufthansa or AZAL, the latter also being known as Azerbaijan airlines. From the United States, on the other hand, you can take a flight from New York with Azerbaijan Airlines. Turkish Airlines also provide a flight, but it connects to Istanbul. There are other planes as well, but none of them are direct. They connect with Berlin or Frankfurt, Moscow, Paris, or Qatar, depending on the airline you are taking. Azerbaijan can also be reached by train. However, you can take the train only from Georgia. So, if you are ever in Georgia, which is also a beautiful country, by the way, you can go straight to Azerbaijan from there. Another thing that you should know before going to Azerbaijan is the means of communication. Azerbaijan has gained its independence from the Soviet Union, but Russian is still spoken in Baku and other regions. The official language now is Azerbaijani, also called Azeri—Turkic. It is related to the Ottoman Turkish. Even so, you can still use English to communicate, but only with the younger generations. As you can imagine, English is spoken in hotels or other such establishments, but if you want to visit a remote village where the population is relatively old, you do not stand a chance with English. The best time to travel to Azerbaijan depends on what you want to visit. You should know that Azerbaijan is geographically diverse. It has everything from high mountains to the sea. The Caspian Sea. The lowlands should be visited ideally from April to June because it can get very hot in July and August. But the latter period is perfect to see the high mountains because they are pretty inaccessible in the winter. If you want to go just to Baku, you would better do so in October. It is not too hot or too cold, and people have a lot of fun there. The official currency of Azerbaijan is the Manat from 1992. After the inflation of 2006, the government introduces a new manta. Even so, it is best if you take US Dollars or Euros when you go there and change them at the bank, exchange bureaus, and so on. You can also use your credit or debit card to pay for your hotel or restaurant, but not all of them accept this means of payment. If you pay cash, it is recommended that you pay the exact amount so that you do not lose your change. When you are out of cash, you can withdraw money from an ATM. Most international cards work. However, not all ATMs take EC, Cirrus or Maestro. You cannot fail with a Visa. You should not worry about accommodation and safety. The standard and hygiene for any given service have knows a lot of improvement in the recent years. You have private hotels such as Marriott and Hyatt. However, do not expect to find accommodation cheaper than 30 Euros. As for safety, there is low criminality in Azerbaijan, but you should be careful nonetheless. Especially at night. When it comes to religion, you have nothing to worry about either. The citizens of Azerbaijan are mostly Muslim but their lives are not very affected by it. They have a strict separation between state and religion. They do not practice their religion like most Muslim countries, except maybe for the Ramadan, which they keep. Other than that, they live in peaceful coexistence with Christians and Jews. Azerbaijan also has a pretty efficient health care system. Medical attention is free even for tourists, but it is probably the best not to rely on it outside Baku. You should always carry a copy of your international health insurance, just in case. At the same time, avoid drinking tap water just to be on the safe side. We reached one of the people’s favorite section, and that is food. Azerbaijan is very rich in culture, but when it comes to food, you may get back 5 pounds heavier. The diet there is influenced by Turkey, Georgia, Iran, and Central Asia. As you can imagine, it is diverse, and most of the spices and vegetables are homegrown. Of course, the food depends on which region you decide to visit. You will find a lot of fish near the Caspian Sea and a lot of mutton in all the other areas. Lamb and mutton are the most popular, but beef and poultry are also consumed. Either way, the food is exquisite and you will have the best kebabs ever. Make sure to check them out. Plus, you will receive a nice cup of black tea that may be flavored with cardamom and cinnamon with every meal. You will also get a piece of baklava or halva, which are both delicious. Azerbaijan is a country worth visiting despite the common misconception that may be out there. Even so, you know how the saying goes. When in Rome, do as Romans do. That is why it is best if you do some research on every single destination that you plan to visit. Hence this piece.